The Elders will provide opportunities for Indigenous and non-Indigenous people to learn about Indigenous culture, traditional knowledge, and receive spiritual support. They offer opportunities for delegates to connect with an Elder one-on-one and provide support for learning regarding Indigenous customs, cultural teachings, and knowledge. Wilson Bearhead (Nakota) from the Paul First Nation is EPL’s first Elder in Residence. He is a cultural educator and member of the Wabamun Lake Indian Band in Treaty 6 territory, Alberta. Elder Wilson Bearhead has served as a traditional helper in ceremony and community events, and has also served as the Grand Chief of the Confederacy of Treaty 6 First Nations and Alberta Regional Chief for the Assembly of First Nations. He has tremendous experience working with Indian residential school survivors and their families, educating non-Indigenous people, and assisting in the reclamation of culture through teachings and ceremony. Martha Campiou is a Cree Elder from Driftpile First Nation. As an educator, she is honoured to provide teachings on traditional protocols, ceremony, and culture. She is an artisan recognized for her beadwork, and leads a group of powwow dancers. Martha has long been active with the Indigenous community in Edmonton, including with the Institute for the Advancement of Indigenous Women, and the Canadian Native Friendship Centre. She has worked for some years with the Alberta Indigenous Games and is currently President of the 2017 Games, to be held in August. She is a recipient of the Esquao Award which honours Indigenous women who have made positive changes in their community and who are an inspiration to others. Generous in sharing her culture, Martha builds bridges of understanding and awareness between Indigenous and non-Indigenous people. 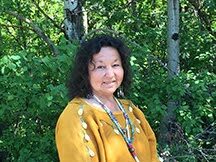 Theresa Strawberry is an Elder Advisor from the O’chiese First Nation. She provides cultural awareness education to the public. She shares her personal and professional experience to send a strong message of empowerment. The past, present and future can be measured in the strength of our resilience to move forward. “Time to let go and embrace on the true power of teachings.” Providing an overall connection to communities with Cultural education, programs and services, she is the founder of the “Kis Sai Wah Toe Tat Towin Society”. Her vision is to be the model of connectivity used for all communities to break down barriers, to come together, understand each other, for example, First Nations, Cities, Provinces, Countries and the World. “To join, heal, honour, to celebrate the birth of a new spirit coming to life.” She is a very powerful speaker with a wealth of knowledge. Speaker to Conferences, Elder Strawberry was honoured with the Culture Award at the 2015 Esquao Awards. Currently, Theresa plays a key role as an Elder Liaison providing counselling, ceremonies for healing, along with other Elder duties at the Edmonton Institution for Women. Her work is very meaningful, as she draws a very special connection with many. Harold (Harry) Watchmaker is a traditional knowledge keeper and ceremonialist from Kehewin Cree Nation in Alberta. He has served as a cultural support to the Indian Residential School Resolution Health Support team for the duration of the Truth and Reconciliation Commission and continues to culturally support individuals, communities, agencies, and industries across Canada. Harry has worked as an advisory Elder with groups such as Tribal Chief Ventures Inc., Bent Arrow Traditional Healing Society, Boyle Street Community Services, and many others. In addition to his community work, Harry is knowledgeable and experienced in the areas of the Sun Dance, Horse Dance, Chicken Dance, and the sweatlodge ceremony (among other ceremonies). Harry believes it is his duty to share, support, and remind Canadians about the traditional teachings and practices which he has received from his Elders and other communities. The University of Alberta respectfully acknowledges that we are situated on Treaty 6 territory, traditional lands of First Nations and Métis peoples.